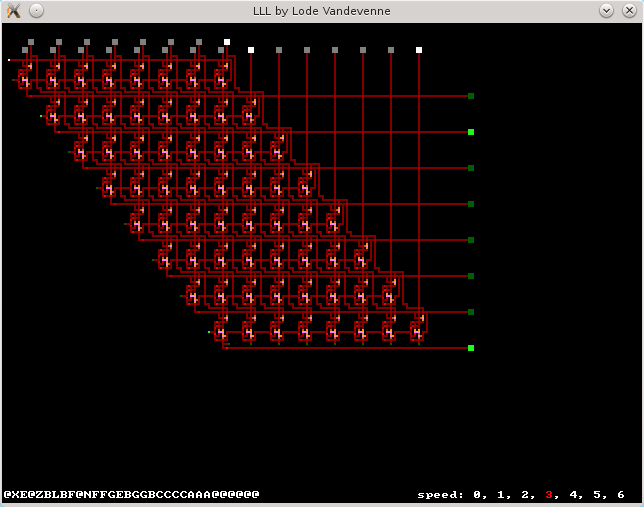 LLL is an esotiric programming with logic circuits. It includes an interpreter (written in C++) that allows running LLL programs. Unlike most esolangs, LLL doesn't have an instruction set. In LLL, you build your own virtual hardware, and if the concept of instructions is relevant to your circuit at all, it's you who chooses them. There are no size boundaries, and it should be possible to build an existing CPU in it if you know its logic gates. It has an interactive mode that shows the logic running and allows creating inputs that can be clicked with the mouse and visible outputs. However, the language also has special inputs and outputs for console I/O, and can be ran in console mode, to allow to create actual console programs.